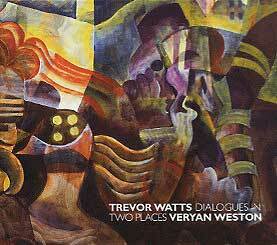 Trevor Watts, alto and soprano saxophones; Veryan Weston, piano. CD 1 recorded at the Guelph Jazz Festival, Ontario, Canada on 10 September 2001; CD 2 recorded at the Robinwood Concert House, Toledo, Ohio, USA on 29 June 2011. Cover painting (front cover reproduced above) The buskers by Roland Jarvis; design by Wesley Richardson.